Hot out of the oven, served on a bed of French Lentils, these sweet and spicy carrots and yams look elegant with a cooling touch of yogurt drizzled over it. An easy to prepare and beautiful main dish. Put the yams, carrots, onions, maple syrup, ginger, ghee, turmeric, cinnamon, salt, pepper, and cayenne in a large mixing bowl. Mix together and transfer to a large covered baking dish. Bake for 30-40 minutes or until vegetables are as tender as you like. Taste and adjust the seasonings, if desired. While the veggies are baking, cook the French lentils in a generous amount of boiling water with bay leaves. When the lentils are tender, about 20 minutes, drain them and discard the bay leaves. Set the lentils aside while yams and carrots cook. 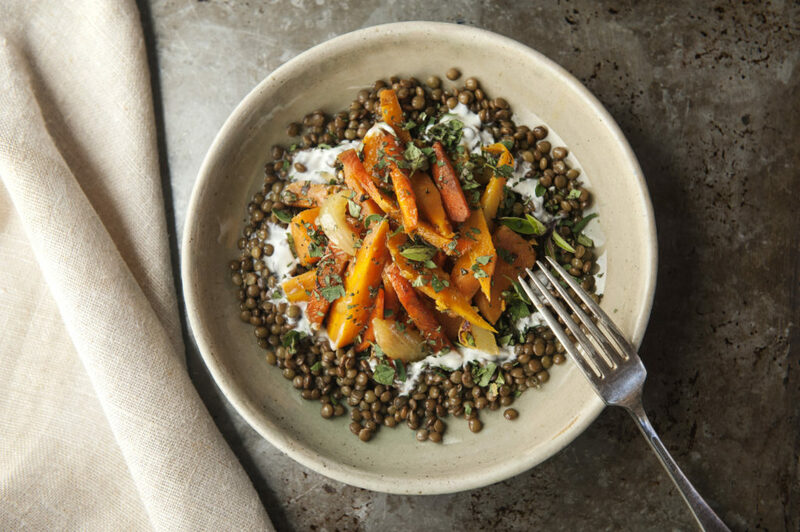 Serve the Moroccan Vegetables on a bed of lentils. Drizzle with yogurt and garnish with cilantro.